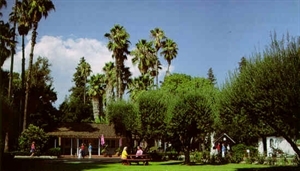 Description Founded in 1894, the historic Graber Olive House is located in a pleasant residential area north of Ontario's business district, just minutes from the Ontario International Airport. Here in quiet and serene surroundings, visitors are welcomed and delighted to discover a bit of early California! Tours are available throughout the year and in the Fall visitors may view the many activities which center around the long and careful tradition of grading, curing and canning Graber Olives. Add Graber Olives to your free online travel itinerary.